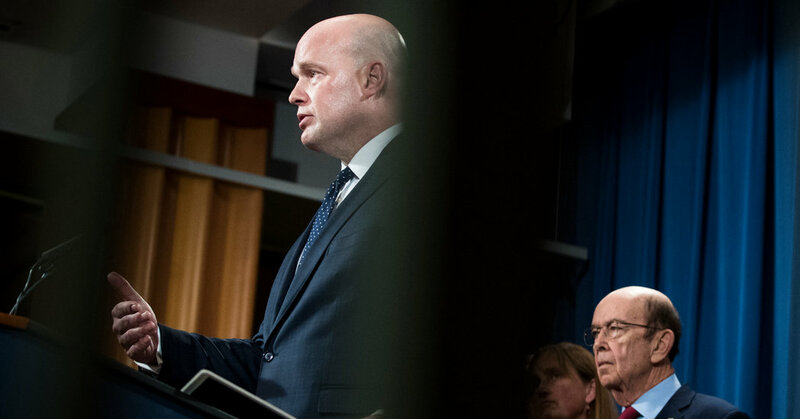 WASHINGTON — After a heated back and forth with House Democrats, the acting attorney general, Matthew G. Whitaker, told lawmakers late Thursday that he will testify before the House Judiciary Committee as scheduled on Friday, having received assurances that they would not issue a subpoena for his testimony. Earlier in the day, the Justice Department sent the committee a letter demanding a commitment in writing that any subpoena not be used during the hearing, a promise that the committee chairman, Representative Jerrold Nadler, Democrat of New York, would not give. But after negotiations that began early in the evening, the committee agreed not to issue a subpoena during on or before Feb. 8, according to a Justice Department spokeswoman, Kerri Kupec. “In light of that commitment, Acting Attorney General Whitaker looks forward to voluntarily appearing at tomorrow’s hearing and discussing the great work of the Department of Justice,” Ms. Kupec said. Mr. Nadler originally told Mr. Whitaker that there would be “no need” for the subpoena if he came prepared to answer questions, and that the committee was willing to work with him on a case-by-case basis on any question he felt he could not answer. Once given a verbal promise that the subpoena would not be used, the Justice Department told the committee that Mr. Whitaker would be at the hearing on Friday. The latest turn in the political drama started on Thursday morning, when the committee voted to give its chairman, Mr. Nadler, the authority to subpoena Mr. Whitaker if he did not answer questions during the hearing or if he chose not to show up. Democrats want to ask Mr. Whitaker about matters related to the Russia investigation led by the special counsel, Robert S. Mueller III, and whether Mr. Trump replaced Attorney General Jeff Sessions with Mr. Whitaker in order to interfere with that inquiry. Some Democrats consider Mr. Whitaker’s appointment to be illegitimate. While Mr. Whitaker had agreed to testify voluntarily, the potential that Mr. Nadler could subpoena him in the middle of the hearing was essentially a threat to initiate contempt-of-Congress proceedings if Mr. Whitaker refused to answer questions without a legal right to balk. On Thursday afternoon, the Justice Department demanded that Mr. Nadler not use that power during the hearing. The letter raised the possibility that Mr. Whitaker might not testify before William P. Barr is confirmed as the next attorney general. The Senate Judiciary Committee voted along party lines on Thursday to send Mr. Barr’s nomination to the full Senate. During the first two years of the Trump administration, when Democrats were in the minority, they bristled when officials like Mr. Sessions refused to answer their questions about communications with the president on the grounds that Mr. Trump might, in the future, want to invoke executive privilege over them — even though Mr. Trump never actually did so. Executive privilege is a power that presidents have claimed under the Constitution to prevent Congress from gaining access to internal executive branch information, like confidential communications between the president and his advisers. But such information is not legally shielded from Congress by default; rather, the president is supposed to choose whether to invoke executive privilege in any particular instance — at the cost of accepting any political fire for keeping that information secret. With Democrats now in control of the House, Mr. Nadler is trying to avoid such stonewalling. On Jan. 22, he sent Mr. Whitaker a letter outlining questions that Democrats might ask him about his conversations with Mr. Trump and asked him to consult the White House ahead of time about whether Mr. Trump would invoke the privilege over them. Absent such an invocation, Mr. Nadler wrote that the committee would otherwise expect answers at the hearing. If a witness refuses to answer a question during a congressional hearing without a legal right to do so, the House can vote to hold him in contempt. Congress can then ask the Justice Department to prosecute him or file a lawsuit asking a judge to order the witness to provide the information, raising the further possibility of being imprisoned for contempt of court. But a valid assertion of executive privilege would provide a lawful basis for declining to answer. In 2012, Eric H. Holder Jr. was the first attorney general to be held in contempt of Congress for refusing to comply with a subpoena for information. Justice Department officials then declined to prosecute Mr. Holder, saying they had the discretion to not prosecute an executive branch official who claims executive privilege. But the Justice Department has long considered a subpoena to be a necessary precursor to Congress holding an executive branch official in contempt. Its letter to Mr. Nadler demanding that he agree not to issue the subpoena during the hearing, therefore, amounted to a demand that he not initiate contempt proceedings against Mr. Whitaker during the hearing and instead commit to negotiating over any disputed information afterward, once any questions have actually been asked. “We cannot understand this measure other than as an attempt to circumvent the constitutionally required accommodation process and thereby to transform the hearing into a public spectacle,” the department’s letter said. The letter also noted that previous executive branch officials of both parties have declined to answer questions that might be subject to executive privilege, and cited a 1982 Reagan administration policy instructing officials asked by lawmakers about information that might be subject to the privilege to hold the request pending a final determination. Still, those precedents did not address a situation in which the White House has advance notice about what will be asked. At the committee meeting earlier on Thursday, the approval to give Mr. Nadler the authority to issue the subpoena fell along party lines. Representative Doug Collins of Georgia, the committee’s ranking Republican, called the subpoena “political theater.” In a statement, Mr. Whitaker agreed. While Mr. Nadler said that the committee would conduct the hearing in good faith, he did not withdraw the subpoena, leaving open the possibility of using it at a future date. Blame Trump’s Tariffs and the Weather. New York’s Farmers Do. August 22, 2018 Comments Off on Blame Trump’s Tariffs and the Weather. New York’s Farmers Do.